A masterful mover with excellent paces, presence, positive attitude and pleasure to ride, these combine to make Dance of Joy perfect in every way. Not only is he an impressive competition pony, he also has an impressive pedigree as his sire, FS Don’t Worry, has achieved unbelievable breeding success. Dam: Valentina is also the dam of 3 other "Hengstbuch I" graded stallions - Derby (who competed as Three B Derby) (by Derby), Don Bijou (by Dijon) and Don Carlos (by Dijon). She is also the dam of a further 6 competing progeny, of which the most successful (after Dance of Joy) has been Bourbon 16 (by Brillant) who won over €2,700 in Dressage competitions, including winning at A & L levels in Germany and Freixened W (by Folklore) who won over €1,100 in Dressage competitions, including winning at A & L levels in Germany. Valentina's damsire is the Welsh Section B Black Magic, who descends from the best Welsh Section B foundation lines of multiple Royal Welsh Champion Criban Victor and Chirk Crogan (a winner in hand and under saddle and found in the pedigree of man top-class Welsh ponies. Valentina is the full sister to the German licensed stallion Valiant Starlight who competed successfully in dressage and jumping as Valiant Star and sired Vivaldi 39 (who initially evented before specialising in dressage) who in turn sired the International Dressage pony stallion, Voyager 2, out of Nirvana (Night-Power x Merafic ox), who was the 2006 double Bundeschampion in Dressage & Eventing then won Dressage Team Gold at the 2013 Pony Euros with the German Team and himself sired the international Eventing ponies Veith 14 (3rd at CCOP1* and 2nd at CCIP 2* in 2017 and Vera S (completed CCOP1* & CCIP2* in 2015). Valentino was a British-bred pony who was originally registered as the British Riding Pony, Oakley Bubbling Bobbety before being exported to Germany where he was renamed and became one of the foundation sires of the German Riding Pony breed. Of his direct descendents, the most successful in Germany were Drei B Valerian (Pony Euros Team Gold in 1990, Team Gold & Individual Gold 1992), Vital 11, Viktor 14 Valencianer B who all won over €6,000 in the 1980s. Valentino's sire was Bwlch Valentino whose period of success as a sire lasted longer than any other British Riding Pony stallion. Valentino was also the damsire of the legendary Dancer, who competed as Broomford Dancer for GB and who was one of the first ponies to represent multiple nations at Pony FEI Level. Dancer was also a top sire with one of his sons, Golden Dancer, being a multiple Gold medal winning International dressage pony. Joy was licensed and honoured as a Premium Stallion by the Rheinisches Pferdestammbuch in 2002, completed his 30 day test in 2004 then was accepted into the Rheinisches Pferdestammbuch Hengstbuch I in 2010. He was a Bundeschampionat finalist as a 3 year old, when he placed 9th in the Riding Ponies (Stallions) final, then was 9th again as a 5 year old Dressage Pony and then 7th as a 6 year old. 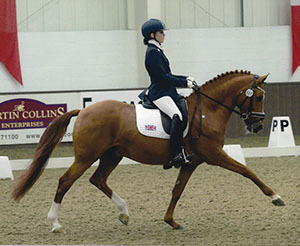 In 2010, Joy was bought by Rachel Ablett as a schoolmaster for her then 12 year old daughter Imogen and in 2012 they started competing in British Dressage Elementary and Medium classes achieving many wins and top 3 places with many scores of 70% and over. They were 6th in the 2013 Keysoe Elementary Restricted Summer Regional Championships then started competing in the Pony FEI tests at the end of that year. Good results in these classes resulted in Imogen & Joy being selected for their first international, the 2014 Addington CDIP where they qualified for the Kur. With Imogen being 16 in 2014, so out of Pony classes, Joy retired from International competition and has now been accepted as an SPSS ELITE graded stallion in recognition of his international competition record. 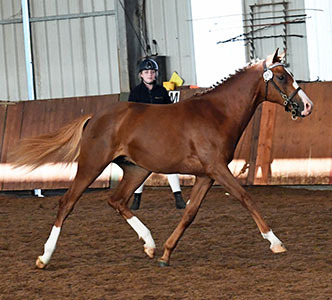 In the UK, Joy's first UK born progeny, his yearling son, Dance of Destiny (x Ricardo Go For Gold) was one of just 2 ponies to be awarded a coveted Futurity Elite premium when he gained a mark of 9.0 in the Dressage section at the 2017 BEF Futurity Evaluations and he finished the year as the Top Pony Yearling. In Germany, Joy has 3 offspring with competition records, Dein Jolly Jocker (2006 x Deviano), Dirty Dancing 32 (2006, x Vagabund) and Joy's Design (2008, x Spanenland's Patrick). 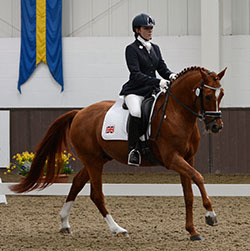 Joy's Design is the most successful, having won over €1,500 including wins at the E, A, A18 and L dressage levels in Germany. Joy has a wonderful temperament and completely lives up to his name in all aspects being easily handled by children. His conformation is excellent and, when x-rayed for grading purposed as a 17 year old, the vet made special mention of his super clean limbs. 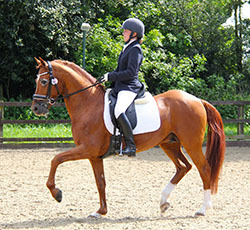 With his own proven performance and the proven quality of his progeny both in the UK and abroad, he is an excellent choice for those looking to breed quality, athletic dressage ponies with a great temperament.